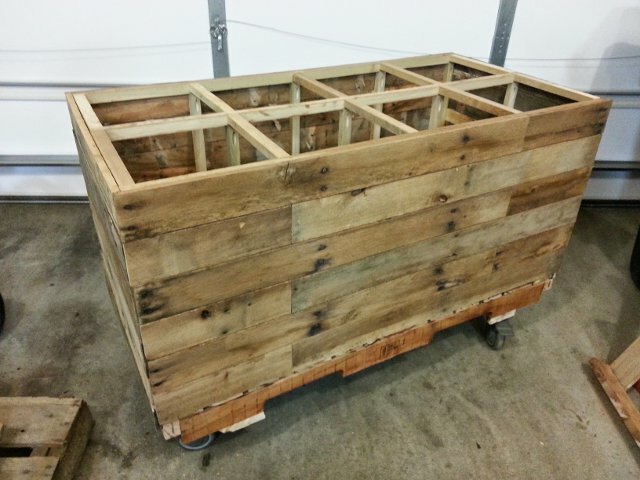 I use pallets to build reclaimed furniture from time to time, but when I first got into it…I really got into it! Like pulling off the side of the road and grabbing every pallet I could find kind of into it. Before long I had a dozen or so pallets strewn all about the garage. I figured it was time to break them down and clean up the shop so I pulled out the sawzall and started ripping them apart. After the carnage was done I had eliminated the 12 pallets, and produced 60+ boards. Hmmm, bigger mess. I had to organize this stuff before it buried my shop. I came up with this Mobile Pallet Wood Storage unit and it has worked beautifully! It’s a 2’x4′ footprint so it’s not too big and being mobile it allows me to position it wherever I want. I sectioned it off into 8 cubbies of 1’x1′ that are 24″ deep. This allows me to separate by board size and type and keep some semblance of order. 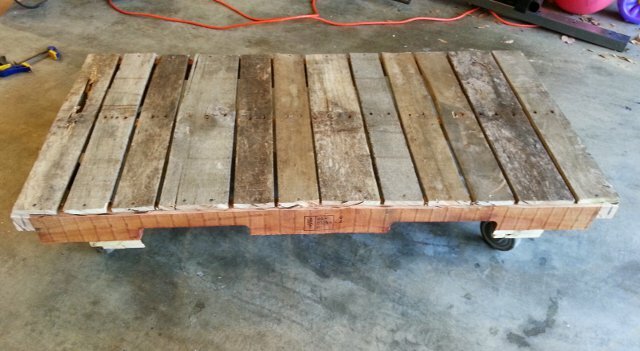 The entire thing was made out of…wait for it…pallets. Yeah, guess that was kind of obvious. 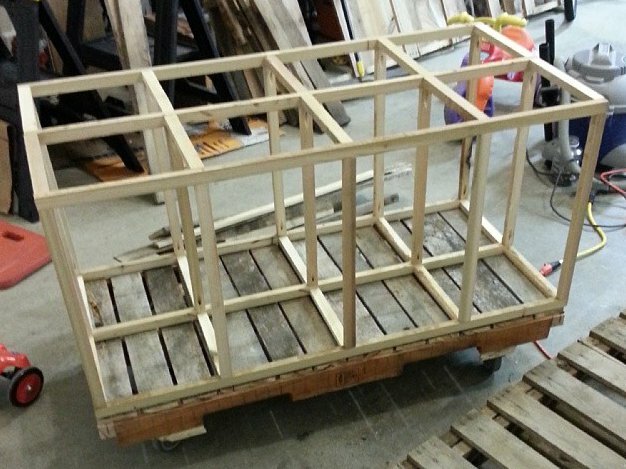 If you didn’t want to mess with pallets you could easily make the same design out of 2×4’s, 1×4’s and plywood sheathing. Please note, I made this before upgrading my lighting and using a tripod for my pictures. So please excuse the pic quality, I’ve gotten much better since then! 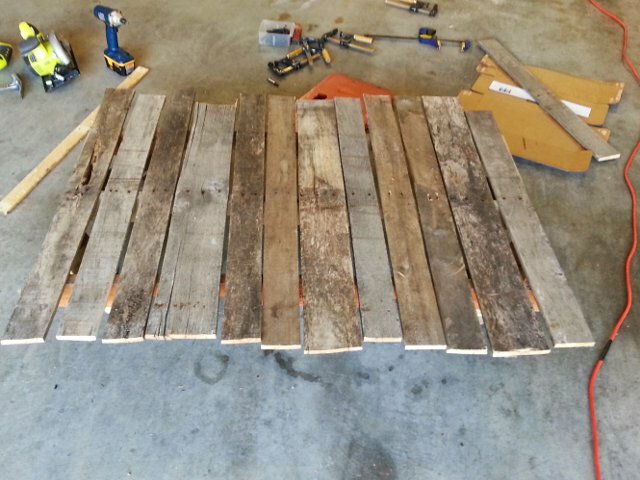 I started with 5 pallet runners (the long 2x4ish boards that the deck boards are attached to). 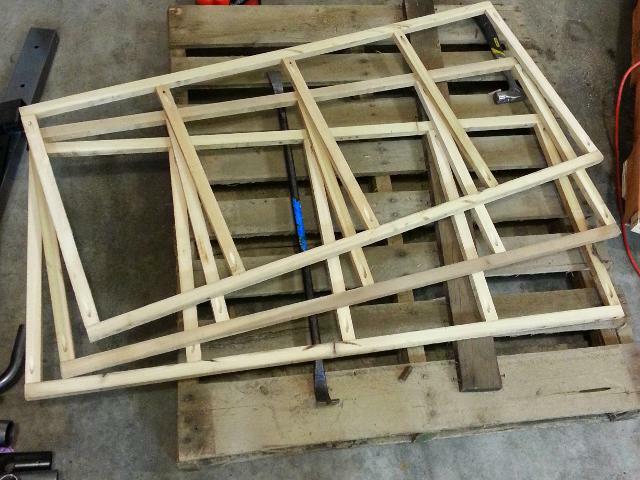 I left 3 of them at full length, these happened to be 46″ and then cut 2 down so they were 24″. I centered the cut out because I’m a sucker for symmetry. 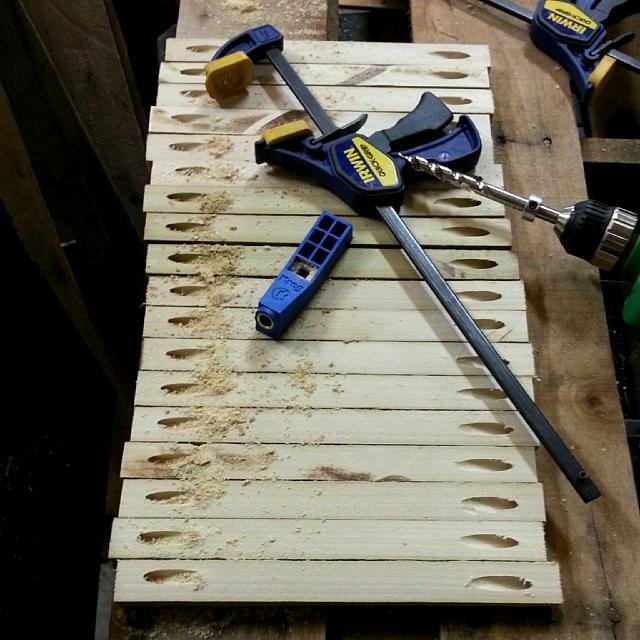 These boards make up the base and I glued and screwed the 24″ boards onto the end of the 46″ boards as such. You can see that the boards aren’t exactly straight, especially the top one. 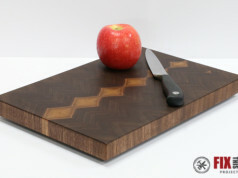 So when you are selecting boards, find the best ones you can! Also I would probably cut the 24″ pieces so the ends were full width if I did it again vs. having the cut out on the ends. 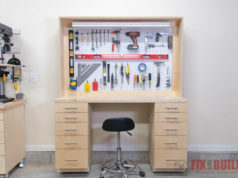 It would allow more room for screws. Next I needed to add some cleats for the wheels to be attached. I used deckboards for these cleats. 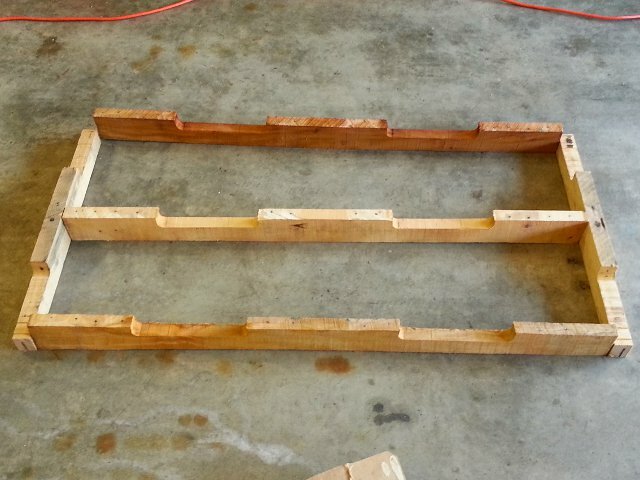 Since the boards were only about 1/2″ thick I doubled them up to get a 1″ thick board and glued and clamped them together in the center. 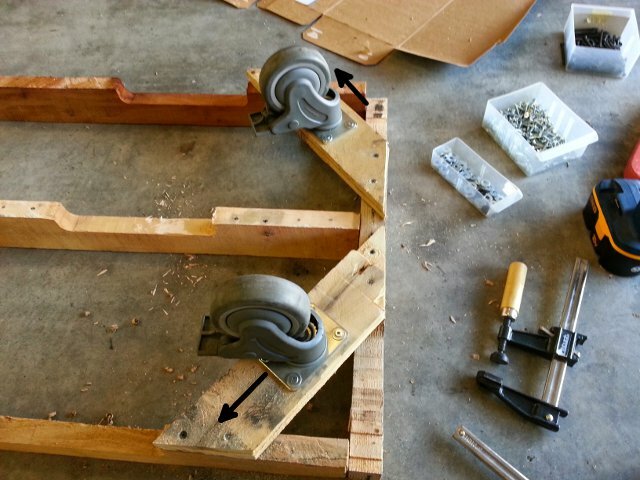 I attached the double thick glue up with 2 screws on each side. 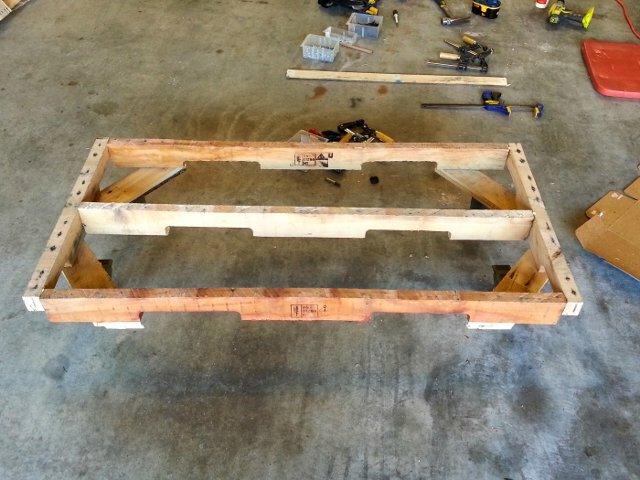 The measurements aren’t real important here, just make a surface to hold mounting plate of your wheels/casters. Note: Moving these cleats closer to the corners would have helped me fix the screw up you’ll see next. I mounted the wheels on the cleats and as you can probably tell in the picture, it wasn’t balanced very well. Of course I didn’t realize this until I turned it over and stood on it to test stability and almost flipped off! I ended up moving the wheels out to the front and back edges as seen by the arrows and this stabilized the base. I flipped it over and this is what I had. Of course the wheels are still in the wrong position because I didn’t stand on it until I put the deckboards on. 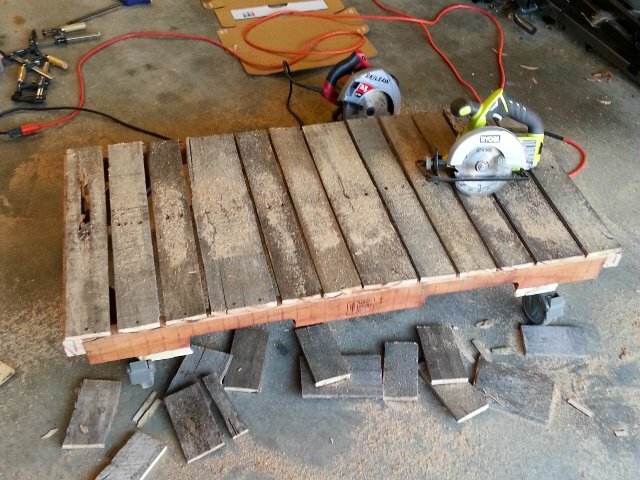 Next I took a bunch of the deck boards from the pallets I had broken down and screwed them down to the base. I centered the middle nail holes of the boards on the middle brace. 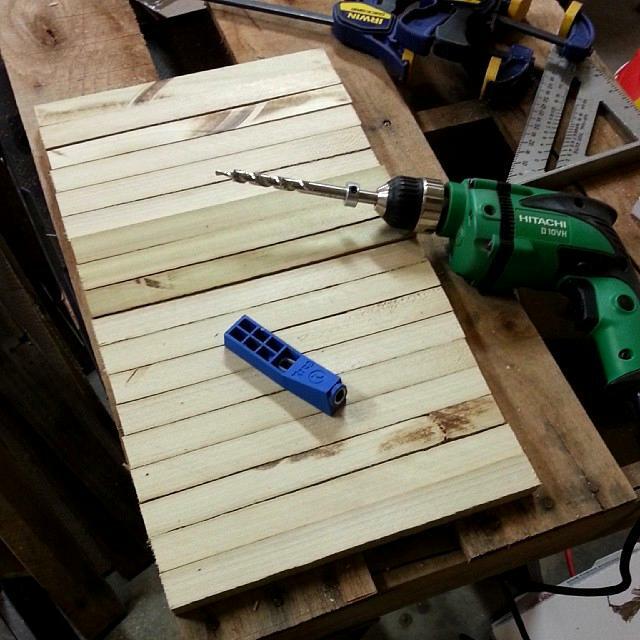 This let me use the nail holes as a pilot hole for the screws. Of course I denailed all of these deckboards first…yeah, that’s a lot of fun. There was really no rhyme or reason to how I attached these. I left gaps between the boards so sawdust and dirt could fall through and be cleaned up instead of having to try to vacuum inside it. I attached the boards with 1-1/4″ screws after drilling pilot holes. After attaching the boards to the front and back rails I came back with the circular saw and just the boards down to size all in one cut. 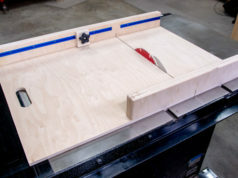 If you were decking the base with 1×4’s or plywood you would be better served cutting the boards to size individually from longer lengths. All these deckboards were less than 48″ so I could only get a single 24″ board out of them or I would have cut them in half to get 2 boards. After cleaning up I had my base. 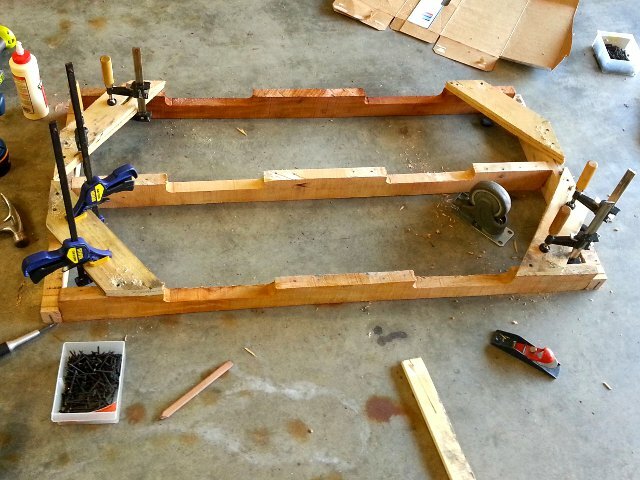 Next up was to make the frame to go on top of the base. 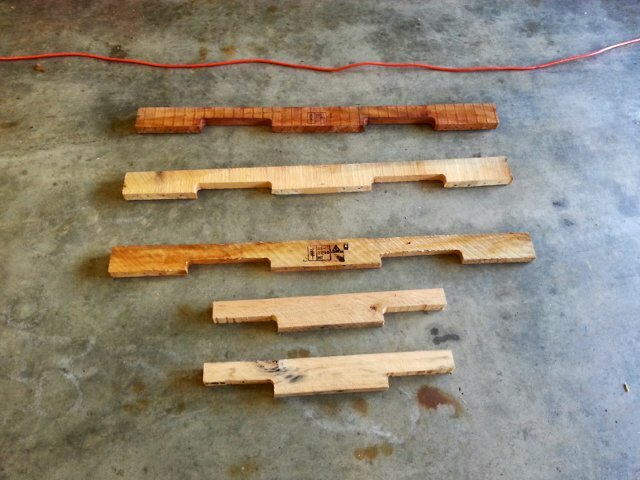 A couple of the pallets I picked up had these great pieces of 1″ thick poplar nailed to the top of it. I assume these were used to block the base of a piece of equipment or furniture. I ripped them down so I have 3/4″ by 1″ pieces for the frame. Again, these dimensions aren’t critical. Make due with what you have or you could buy 1×1’s or similar from the big box. Out of this wood I made 3 frames, similar to the face frames of a cabinet. 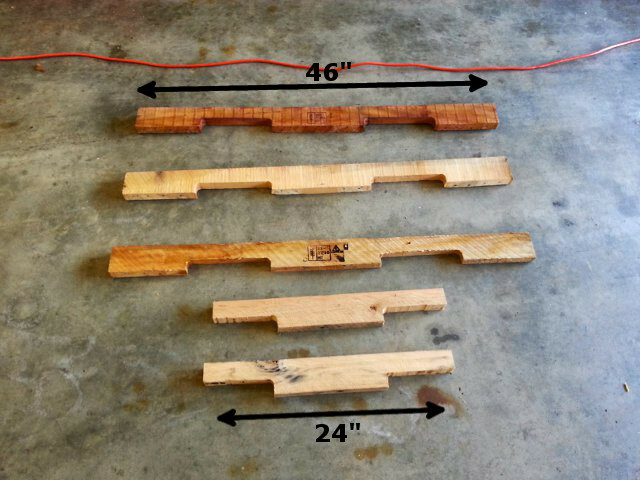 Each frame had a top and bottom piece that were 48″ long and 5 connecting vertical pieces that were 22-1/2″ long. This gave me 3 frames that were 48″ x 24″. I cut pocket holes in all the 22-1/2″ pieces to join them to the top and bottom. 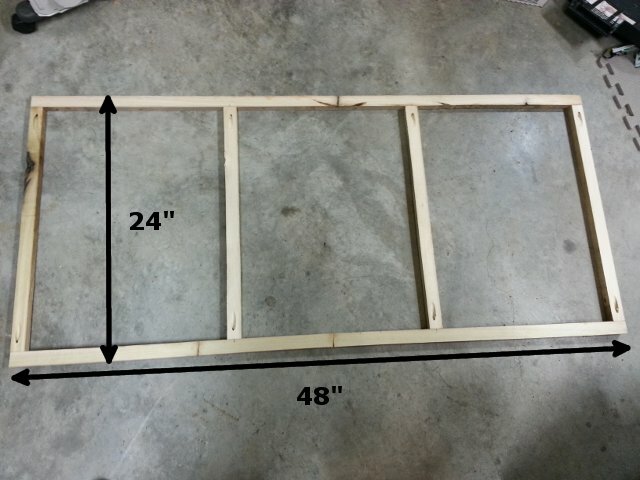 This was before I had my K4, so I made all the pocket holes to attach the frames together using a Kreg Mini. I can say…I love my K4! Using the Mini on that many pieces was less than fun. Here is one of the finished frames. I finished 2 more and had the main structure for the cubby system. 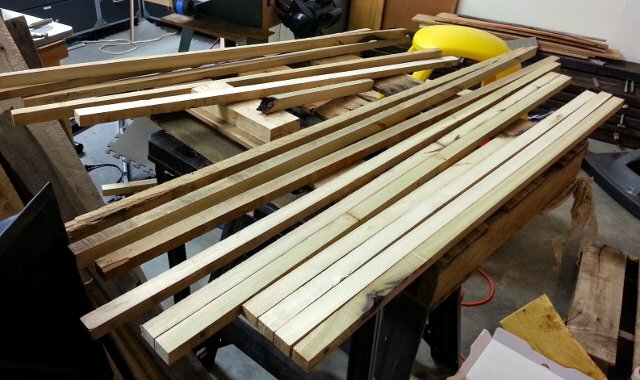 I then cut 20 pieces out of the 1″x3/4″ poplar that were 10-7/8″ long. These pieces attached the frames together into a big grid. I assembled the cubby grid together first and then screwed it down to the base. At this point all the is left is to skin the unit with pallet boards. The key here was to find boards that were the same width and use them alternating to finish a row. I attached the boards with 18ga brad nails. All that is left now is to fill it up with boards and enjoy getting the wood off the floor! 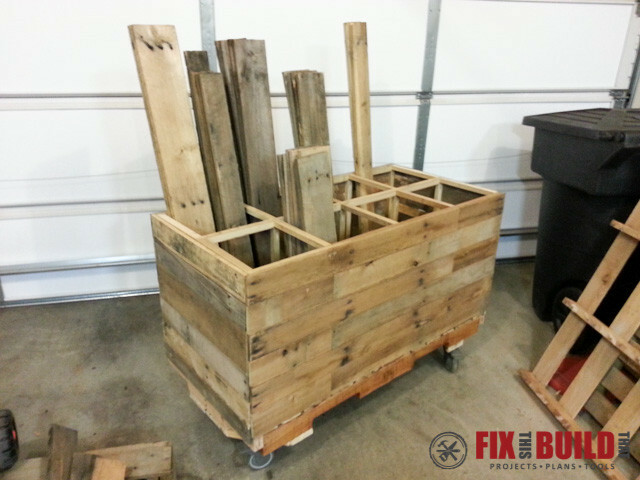 This mobile pallet wood storage unit can be customized a ton of different way, I just wanted to give you an idea of how I did this one. 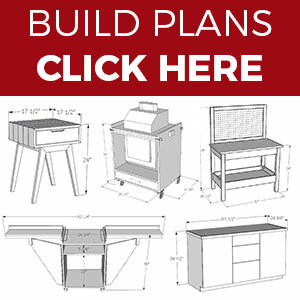 Cater the wood used and dimensions to your needs.